How Much Does Domestic Violence Impact Divorce? Making the decision to leave a spouse is a life changing event, and having that conversation about the end of the marriage will be one of the hardest a person will ever experience, but when domestic violence is an element of a marriage, this conversation may not even be possible. There is no sure way to know how a person will react to news of divorce, but a domestic abuser will not take the announcement well and could harm the victim in retaliation. Thus, most domestic violence victims must find a way to leave in secret, which often means leaving everything behind and starting over from scratch. This act takes bravery and determination, but an important follow up question is how to legally end the relationship so the abusive spouse no longer has rights to the marital property, and to address child custody concerns. Divorce is a complex process without the added complication of domestic violence and someone facing this situation needs an experienced divorce attorney to ensure he/she is properly protected during and after the divorce process. Because these cases are not straightforward, abused spouses may fear divorce is not a realistic option. While domestic abuse often implicates criminal charges, even without them, evidence of domestic violence can influence the final judgment issued in the divorce case. The primary area domestic violence affects the court’s approach is in the area of child custody. 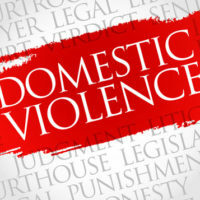 Domestic violence could reasonably be viewed as detrimental to the child, and can convince the judge to order sole custody to the victimized parent. Basically, any behavior that could negatively affect the child’s wellbeing will be scrutinized to see which arrangement would be best. There is no guarantee the judge will cut off custody rights, but the court must take into account safety concerns for the parent and the child when making custody arrangements. The other two areas in which domestic violence is taken into consideration is property division and spousal support. If abuse caused the spouse to experience less employability, earn less income, or suffer an injury that inhibited work, these factors would be used by a court to decide if alimony was appropriate and if a greater share of the marital estate should go to the victimized spouse. The focus with alimony is preventing severe financial discrepancies after divorce; with property division, finding a distribution that is fair based on the facts of the case. In addition, abused spouses need to seek an injunction for protection to keep the abusive spouse away. Ideally, this is obtained before the victim is forced to leave the family home, as ordering the abuser to leave the residence is a common feature of these court actions. They also forbid any form of communication and can address temporary child custody and support arrangements until the divorce is finalized or the injunction lifted. These injunctions help prove the abuse was happening, both for purposes of filing criminal charges and to impact the divorce issues mentioned above. An experienced divorce attorney should be contacted about securing this protection for everyone’s safety. Divorce brings a lot of unknowns, but living with violence is not a situation you should tolerate. Joyce A. Julian, P.A. knows how to fight to get you the best possible settlement in these circumstances, and is available to take your call. Contact the Fort Lauderdale divorce firm at (954) 467-6656 for a free consultation.